Preliminary plans for renovations to Des Allemands Park. Des Allemands Park is primed for quite a makeover. 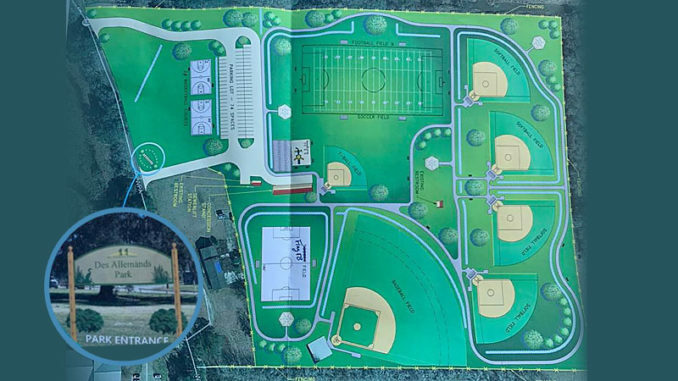 The addition of a new football field and a basketball court are among planned upgrades to Des Allemands Park, according to District IV Councilman Billy Woodruff and as laid out by design plans that became public this week. Other upgrades planned include renovated baseball and softball fields, the addition of sidewalks and an upgraded sewerage system. The football field will double as a soccer field. Woodruff said $400,000 was officially approved for the project in this year’s budget, and noted he’ll seek another $400,000 next year. The upgrades, he said, are planned in phases. An outing to watch his grandchildren play baseball inspired Woodruff to push for renovations, noting the teams that would call the Des Allemands park home have had to play their games on the road, as the fields are considered substandard for league competition. Woodruff said once Parish President Larry Cochran lent his support, engineer Danny Hebert was asked to draw up plans. The councilman also conferred with the Des Allemands Booster Club for feedback on what should be included. He said the hope is to get the ball rolling on the project this year. The basketball courts, Woodruff said, will help with the scheduling of basketball practices, which can at times run late into the evening depending on the availability of indoor gymnasiums. “You have to depend on the School Board to make the gym available, and sometimes you just can’t get it until late in the day. You get to bed at 9:30, 10 … it’s hard on some parents,” Woodruff said. The potential addition of sidewalks wouldn’t be insignificant for many parents, either. “The ground can get wet and, if you’re coming in with a stroller or wagons, it can be hard to pull through. So we think this is a pretty good plan,” Woodruff said.